‘Tough on crime’ policies are often justified on the basis that putting people in prison for longer is what victims want and deserve. In 2013, Californians for Safety and Justice, which campaigns for more effective public safety policy − conducted a survey to find out whether this was what victims in California actually did want. The results turned the established narrative on its head. In this expert blog for PRI, Lenore Anderson, Executive Director of Californians for Safety and Justice, explains how crime survivors are uniting in California both to improve provision of trauma recovery services for victims and to advocate for justice reform. “Tough on crime” has been tough on the United States. For decades, state and federal lawmakers in the U.S. passed thousands of stringent sentencing requirements, dramatically increasing the number of people behind bars and how long they serve. America’s most populous state, California, stood out for its over-reliance on over-incarceration. In a seven-year period in the late 1980s and early 1990s, California lawmakers (often with crime victim groups by their side) passed more than 1,000 new criminal laws, and voters passed tough, lock-em-up measures like “Three strikes.” The result was a five-fold increase in incarceration that forced the state to build 22 prisons over a 25-year period. Ironically, this approach to public safety policy is profoundly unsafe. First, California had the nation’s highest recidivism rate (70%) during the peak of this prison boom. Second, California and the federal government have spent billions of dollars annually on incarceration, draining resources for prevention, treatment and trauma and support services. Fortunately, today there is growing political unity on the need to reform the criminal justice system in America. This is a critical development, but if this new push for reform fails to incorporate the experiences and voices of those most commonly impacted by crime, it won’t lead to the breakthrough in public safety policy that we desperately need. While tougher sentences were sold as the best way to protect crime victims and keep communities safe, most victims in California and across the U.S. have never actually been the center of attention, nor were their experiences and needs thoroughly considered as penal codes and prisons grew. Despite the popularity of pro-victim rhetoric during the prison-building era, few have asked, let alone answered, some basic questions about victims: Who experiences crime? Who is most vulnerable to repeat victimization? What do survivors need to recover and be protected from harm? At Californians for Safety and Justice, we believe that it is imperative to have the answers to those questions inform efforts to change our criminal justice system. That’s why we led two years of inquiry to hear from – and elevate – voices that have been ignored for far too long. 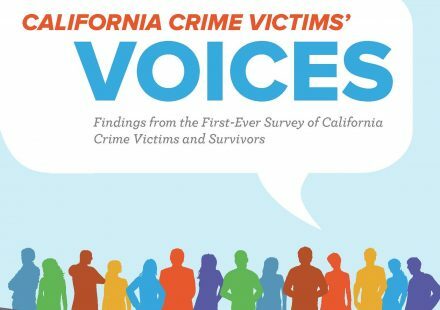 In 2013, we released the first-ever survey of California crime victims, and the results shatter the old narrative about victims – and underscores the need for a new approach to safety and justice. Our research shows that while one in five Californians experience crime, its impact is concentrated and unequal. The majority of crime victims live in lower-income communities, and repeat victimization is even more concentrated. When it comes to violent crime, those most likely to be repeatedly victimized are young people of color, especially African American and Latino males. Young people of color from low-income communities bear an unconscionably disproportionate burden of violence and crime – victimized at staggering rates and also the least likely to get access to help to recover from trauma. Most frequently victimized, least often supported. There is something terribly wrong with this picture. Overall, two out of three crime survivors reported being victimized more than once in the last five years. Many repeat victims have long histories of suffering multiple types of victimization, such as sexual exploitation, abuse or community violence. Worse still, only a small number of survivors receive any help, despite often experiencing severe depression, anxiety and post-traumatic stress in the aftermath of crime. In fact, our research found that survivors of crime were very much interested in services that could help them recover but were often unaware of such services – or found them difficult to access. This was especially true for victims of color. In addition to suffering from a lack of support to recover from crime, most survivors also think our current justice system investments are unwise. Two out of three California victims surveyed believe prisons either make inmates better at committing crimes or have no impact on crime at all. And most survivors want greater investments into rehabilitation, mental health treatment and prevention, not bigger prisons and jails. The data is clear: It’s time to stop pretending that building more prisons protects survivors. Listening to crime survivors can tell us a lot about how we should reform our safety and justice systems. That’s why, in 2013, we launched Crime Survivors for Safety and Justice (CSSJ), a program that conducts outreach to survivors of crime and gives them a voice in public policy. CSSJ has grown into a racially and geographically diverse network of 6,000 survivors with five regional chapters across California. A core part of CSSJ’s work is ensuring that the justice system prioritizes healing and makes trauma recovery services available to more people. With our survivor network, we led efforts to secure $2 million in new, annual funds for Trauma Recovery Centers across the state. These centers offer rapid, comprehensive health and recovery treatment to victims of violent crime – all in one location – immediately after the traumatizing event. Last year, crime survivors endorsed Proposition 47, a California ballot initiative that voters passed with a 20% margin of victory. The measure reduces six nonviolent offenses (e.g., drug possession, petty shoplifting, etc.) from felonies to misdemeanors. The shift will result in a roughly $100 million in prison cost-savings annually, and those funds will be reallocated to community mental health and drug treatment, trauma recovery services for victims, and programs for at-risk youth. Proposition 47 will add about $10 million dollars annually in new funds for victims’ services—more money for trauma recovery than ever before for California crime victims. The work of this network shows what can happen when we embrace crime survivors as advocates for justice reform. Instead of continuing to create harsh penalties that lead to bloated prisons and depleted resources for those most impacted by crime, we can invest in the support communities need to stop the cycle of crime and help victims heal: mental health and drug treatment, trauma-informed services, safe places to go when crisis erupts, family support programs, youth programs and economic recovery assistance for victims. By advancing a new victims’ movement that listens to and supports the people and communities most often impacted by violence and crime, we can reform our broken justice system and win new safety priorities that protect and serve everyone. Lenore is executive director of Californians for Safety and Justice, a nonprofit with 6,000 crime survivor members. She is a former Assistant District Attorney and chief of public safety policy for San Francisco and Oakland, California.